Building a small form factor gaming PC? You must be searching for a good mini iTX motherboard. More obviously, the choice is not that easy. 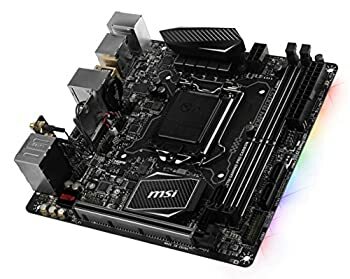 To help you out with that, today I am sharing the list of best mini iTX motherboards of 2019 that you must check out. I have reviewed all good options individually including my personal favorite mini iTX motherboard that I used for my SFF gaming build! Excited enough? Let’s begin. Though these were designed primarily for HTPCs, but with more powerful components being shrunk to smaller sizes, thanks to newer technologies, today you can aim to build a powerful enough gaming build. For that, you will need a powerful mini ITX motherboard, small form factor GPU & RAM and obviously a good mini ITX case to fit all these components. So without further ado, let us get to the list of best mini ITX motherboards you can buy in 2019. The mini ITX motherboards that I have included in this post are ranked on the basis of their performance, compactness, compatibility, and value for the money. You will also find great options for both Intel and AMD sockets. 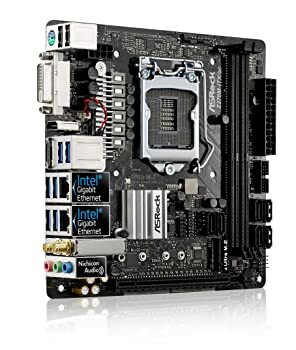 Here is the list of best mini ITX motherboards you can buy in 2019 for your small form factor PC. So, these are the top mini ITX motherboards that are best for building any type of small form factor PC whether it is for home theater or for extreme gaming. For those who are making their first build, let me give you a brief about the mini ITX motherboards. What does Mini ITX stand for? How big is a mini ITX motherboard? In very basic definition, a compact motherboard having size 6.7 x 6.7 inches is referred to as mini ITX motherboard. Due to the smaller size, they are ideal for making small form factor gaming builds or HTPCs. Is micro ATX smaller than Mini ITX? No. Micro ATX has the size of 9.6″ x 9.6″ while mini ITX is 6.7″ x 6.7″ in size. In fact, mini ITX is the smallest form factor for motherboards available in the market. If you want to learn more details about various form-factors of motherboards, read my detailed comparison of mini ITX, micro ATX, and ATX motherboards. Now, let us begin with the detailed reviews which I have divided into two sections. In the first section I have included the best Intel mini ITX motherboards, while in the second section, you will find the best AMD mini ITX motherboards based processors. If you already know what processor you are going to use, just jump the corresponding section. With that said, let me begin with the reviews of best mini ITX mobo for Intel. For those who strongly believe in the Intel processors, here are my recommendations for mITX motherboards that support Intel chipsets. No doubt, MSI is a renowned name when it comes to PC components especially those meant for gaming. With the widest range of support for Intel Chipset processors, MSI Z270I Gaming Pro Carbon is surely an amazing mini ITX motherboard. When I say wide range, it is seriously the widest. MSI Z270I mini ITX motherboard is surprisingly compatible almost all Intel Chipsets from Celeron to the 7th Generation Core Processor. So, you have a lot of choice for processors with this mITX mobo. Being a small form factor motherboard, it does not compromise with cooling. You will get 3 Fan headers with support for water cooling as well. It supports PWM mode for a balance between noise and performance. Along with that, the BIOS gives seamless control over all the fans allowing you to set 3 temperature values at which the fan speed would adjust automatically. That’s something you won’t find in many mini ITX motherboards. Also, the heatsink is optimized with Carbon for maximum cooling. Talking about the connectivity options, you will get the two latest USB 3.1 Gen2 ports, one of Type A and other of Type C. Along with that there are 8 more USB 3.1 Gen1 ports and 6 USB 2.0 ports to fulfill all your connectivity needs. MSI Z270I board also offers one PCI-E x16 slot, Intel I219-V Gigabit LAN port, one HDMI port and one standard Display port. Each of the PCI-e slots is equipped with Steel Armor which acts as a protection against EMI as well as deformation. Build especially for gamers, this mini ITX motherboard features separate Gaming device ports with Gold plated circuitry for the best possible performance. For storage, MSI Z270 provides the most advanced technology with M.2 NVME support. That implies you can use the fastest M.2 SSD for storage and experience a significant difference in the gaming. There’s a DDR4 RAM slot again with a steel armor for increased protection. Beyond that, MSI Z270I mini-ITX motherboard has four SATA3 slots allowing you to have a plethora of storage. I could go on and on with it’s features as it offers a lot but all that comes at a price that not all can afford. But, if budget is not a bottleneck for you, MSI Z270I Gaming Pro is the best mini ITX motherboard in the market today! Next up is Asus’s mini ITX variant for Intel processors – the Asus Strix Z270 ROG mini ITX motherboard. With Strix branding, this mobo is specifically targeted for gamers delivering extreme performance in a small package. Before I unveil its features, let me tell you that it’s a high-end m-ITX motherboard so it’s priced accordingly at around $350 (which is not very affordable). So, coming back to the features, it is meant for the Z270 chipset which is a great choice and Asus have used some amazing patent-pending technologies to deliver the most advanced performance. The PCIe-x16 features the Safe-slot tech which is built with high-quality injection molding for handling heavyweight graphics card. As this Safe-slot feature is patent-pending you won’t see it any other mini-ITX board on this list. Another interesting thing that I personally appreciate about this mini ITX motherboard is the Intel Optane memory support. It enables ultra high-speed read-write operations that will definitely give you an edge over other ITX boards. Along with that, there are two M.2 slots which allow you to take the performance to the next level with NMVe SSDs in a RAID configuration. To tackle the heat, Asus has innovated a double-decker heatsink design yet to be patented that protects the SSDs as well as the PCH from degradation due to heat. There are four SATA 6Gb/s ports which means a shortage of storage space won’t be an issue on your rig. For audio output, Asus ROG Strix Z270I mini ITX motherboard offers 8 channel HD audio which uses exclusive Supreme FX capacitors. With that, you can expect the best quality audio while gaming as well as watching movies or listening to your favorite music albums. In terms of connectivity, you will get 6 USB 3.1 ports – four on the back and two at the front panel of your case. Out of the four 3.1 ports at the back, one is of Type C while there are four more USB 2.0 ports as well. Like all other standard mini ITX boards, there’s an HDMI and a Display Port available on the back panel too. Asus ROG Strix Z270I is RGB enabled and one-click overclocking ready which is a plus point for those building an SFF gaming PC. In my verdict, Asus ROG Strix Z270I is the most premium mini ITX motherboard aimed for gamers. I would only recommend this one if you have no budget issues otherwise you can opt from other affordable options on list. At the third place on our list of best mini ITX motherboards is the MSI B250 Gaming PRO. If you think the previous two are a little over the budget, this one will give you a blend of both the worlds – performance and affordability. First off, it’s not a Z270 chipset motherboard, so overclocking is off the cards but even at regular clock speed, you can expect good in-game performance with great aesthetics, connectivity and storage options. Talking about compatibility, MSI B250I supports a wide range of Intel CPUs with LGA 1151 socket. You easily install 7th / 6th Intel Core processors that can give a great performance and efficiency. I have personally built my own SFF gaming rig with this board coupled with an energy efficient i5-7500, a Corsair 16GB DRR4 RAM and believe it performs like a beast. In fact, it is more like my gaming console :P. I will share more details that build soon in a separate post. MSI B250I Pro motherboard is the best Mini-ITX motherboard under $100 and it still offers support for the latest M.2 NVMe drives and Intel Optane Memory technology as well. It is a clean and well-thought layout for all the components. For connectivity, this mini ITX motherboard is equipped with six USB ports in total with one USB 3.1 port at the front header. Like most mobos, there’s one PCIe x16 slot which steel armored and you can install a high-end graphics card. Some other features include HD audio output, Mystic Light Sync, Debug LEDs and VR support. 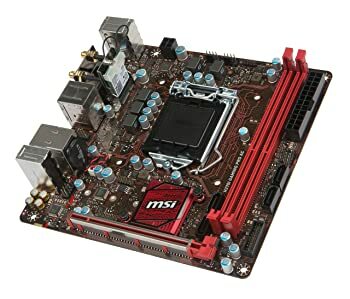 In my opinion, the MSI Gaming B250I is a good mid-range mini ITX motherboard with some of the advanced features that you would want in your gaming build. If you don’t see overclocking as a limitation, this can be your option. The latest addition to ASRock’s mini ITX motherboard collection is ASRock Z370M-ITX/AC. With a great set of features at a smart price, this mini ITX motherboard has a lot to offer to your small form factor build. To begin with, there’s an M.2 slot, a WiFi AC module and dual Intel Ethernet ports which are generally not found in an mITX mobo. I would also give some extra points for as the layout is very well thought especially the distance between the CPU socket and the PCIe slot. As we are talking about CPU socket, the ASRock Z370 M-ITX motherboard uses an advanced Z370 chipset which makes it compatible with Intel’s 8000-series Core CPUs; generally referred to as Coffee Lake. Such an architecture gives you the freedom to overclock K-series CPUs automatically which is a plus if you’ve gaming in your mind. ASRock has used improved power design that offers better power distribution for the 8th gen processors and ensures system stability even in overclocked conditions. I would rather say that ASRock Z370M-ITX/ac so many innovative enhancements in each section. The PCIe x16 slot connects with the chipset via all 16 lanes. There is an M.2 slot for installing lightning fast NVMe SSDs. I have personally seen data transfer rates between 3-4 GB/s with this, which surpasses SATA 6G SSDs by almost 8 times. For storage, you will get six SATA 6G connectors along with RAID support. There are four DIMM slots to have up to 32 gigs of RAM running at 2400MHz and they are also Intel Optane Memory ready. 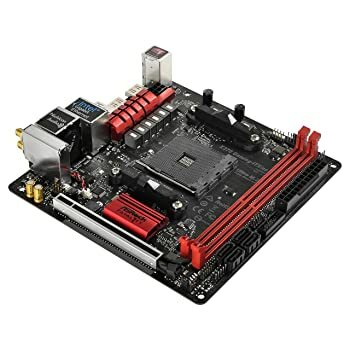 This mini ITX motherboard offers good connectivity options as well that includes 12 USB ports (eight USB 3.0 and four USB 2.0). There’s a dual-band WIFI AC module as well with two wireless antennae for better internet connectivity. Another interesting that I want to highlight here is the 3-Display setup that you can have with this mini ITX motherboard. Thanks to the two HDMI and a standard DisplayPort 1.2 output video. And for better audio, there’s Realtek ALC1220 connection that is capable of 7.1 channel surround sound audio. 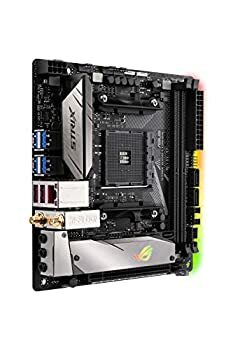 I know I have mentioned a little too much, but you will be surprised to know that all that comes at a price less than $150 on Amazon which makes ASRock Z370 the best affordable mini ITX motherboard for Intel on this list. The last one in the Intel section is the MSI H270I. This mini ITX motherboard is almost identical to the MSI B250 in terms of compatibility and components but the only difference is cost. MSI H270I motherboard is a bit costlier because of the pre-installed M.2 Wifi Card and two Antennae which you can find right inside the box. Just to list out the features of this mini ITX motherboard, you’ll get LGA 1151 socket compatibility, two DIMM slots, one PCIe x16 slot, four SATA 3 ports and one fan header. And all these work exactly like it’s cheaper cousin we’ve talked before. Also, the memory support is up to 32GB with 2400MHz. You can also see that the motherboard layout is also quite similar such as the location of the SATA ports, fan headers and the ports at the rear end. There are 4 Debug LEDs for troubleshooting and a USB 3.1 front header. Just a small upgrade in the layout is the RGB 4-pin connector which is absent in the MSI B250. A minor difference that I noticed in the design is the red accents which might go well if you are building a red themed build. Among other MSI trademark features, there is VR Gaming support, Mystic Light Sync, DDR4 Boost etc. Overall, it’s a good mini ITX motherboard with Wifi AC module but comes at a price that not many may want to invest. Recommended: Want more freedom and extra space on your motherboards for components? Here’s my guide on good micro ATX motherboard which might work great for you! Gamers who consider AMD’s Ryzen processors more powerful, here are the best mini ITX motherboards for AMD chipsets available in the market today. When we’re discussing motherboards, it is not possible to avoid Gigabyte. In fact, our list of best mini ITX motherboard would be incomplete without mentioning Gigabyte AB350N, a great choice for AMD-based SFF build. The mITX motherboard is compatible with all the Ryzen 3/5 and 7 processors as well as upgradable to the next generation of Ryzen processors. The B350 chipset it offers actually falls somewhere between B250 and Z270 in terms of performance. Gigabyte AB350N offers two DIMMs meant for ultra-fast DDR4 RAM (up to 32GB) at 3200MHz frequency which is incredible as compared to other mini ITX motherboards on this list with similar price. To fulfill the storage requirements, this mobo comes with four SATA 3 6GB/s ports along with one M.2 module which you can use for either WIFI communication or an M.2 SSD (if your mITX case allows). At the back, you will find a total of eight USB ports out of which four are USB 3.1 Gen 1, two USB 3.1 Gen 2 and two USB 2.0 ports. That’s a lot of ports for I/O connectivity. Among other features, you will also get RGB Fusion for Lighting, Smart Fan 5 to control fans and 120db SNR HD Audio output. As far as cooling is concerned, there is only one case fan header, one for a CPU cooler and basic heatsinks which is not that spectacular. The best way to cool this otherwise good mini ITX motherboard is to install the AMD Wraith Cooler for CPU and an 800-1000 RPM case fan. Something that interests me here is the layout of the Gigabyte AB350N. Most of the ports are not located in the regular areas as you find in other mini ITX motherboards. The SATA and power ports are at the top, an M.2 slot is on the rear which makes the cable to clutter. You will be needing a case with two big routing holes at the top to accommodate this thing. To conclude, I would say that when you are going to build an AMD based mini ITX build, you cannot find a better mini ITX motherboard for AMD than the Gigabyte GA-AB350N. Next up on our list of best mini ITX motherboards is the Asus ROG Strix X470I. With the AMD x470 chipset and mini ITX form factor, you can literally put the most powerful Ryzen processors on a smaller motherboard – that’s so incredible! With Asus ROG X470I mini ITX motherboard, you cannot ask for more! It offers one PCIe x16 slot, 802.11ac Wifi, USB 3.1, Gigabit Ethernet and support for dual M.2 slots. And, if that’s not enough, you can do all the geeky stuff like overclocking, RGB personalization using Aura Sync. Isn’t that awesome? I know. There are two DIMM slots that offer support for 32GB DDR4 RAM running at a frequency of 3466MHz (O.C.). That’s gonna make your games blazing fast. For storage, there are four SATA 6Gb/s ports with support for RAID. To ensure better connectivity, this mini ITX motherboard offers six USB ports that include four USB 3.1 ports and two USB 2.0 ports. The audio section features a Realtek 1220 codec for high-quality input for streamers coupled with dual OP amplifiers and 120-dB SNR which is compatible with Sonic Studio. For cooling, there is support for the most advanced cooling systems including water coolers and even AIO cooler. And this motherboard sports well-designed heat sink for better heat dissipation. The only concern that kinda puts me off is the single HDMI port for display. If not a three display setup, at least there could be a possibility of connecting it to a TV and a monitor simultaneously if there was a standard display port too. No doubt, Asus ROG Strix X470I has a lot of features to offer for any kind of DIY PC build. In my verdict, this one is the best mini ITX motherboard for AMD based processors available in the market today! The ASRock X370 mini ITX motherboard is basically a variant of Z370, which we discussed earlier, but with AMD X370 chipset. Again, this one is also exclusively targeted for gamers with all the Fatal1ty branding and the red-black design. ASRock has cleverly managed to match the needs of users with the X370 chipset without sacrificing any of the important components even in the restricted space of a mini ITX board. And that kind of justifies a bit pricey listing on the stores. First of all, talking about the processor compatibility, you can choose to install any Ryzen series CPU (Summit Ridge / Raven Ridge) or AMD AM4 A-series APUs (Bristol Ridge). That means there are a lot of CPU options depending on your needs. ASRock X370 mini ITX motherboard offers two PCIe-x16 slots, one of them runs at x 8 mode. For ultra-fast memory, there are two DIMM slots with dual-channel DDR4 technology. There are a total of four SATA 3 ports for storage installation as well as one Ultra M.2 module is present on the rear of PCB for leveraging the benefits of NVMe Solid State Drives or SATA based M.2 drives. For high-speed USB connectivity, there are two USB 3.0 Type-A ports (dark blue), a single USB 3.1 Type-A port, a single USB 3.1 Type-C port and two USB 2.0 ports on the rear panel. In case you want more USB ports at front panel, there are two headers on the front which allows an additional two USB 2.0 ports and two USB 3.1 ports. That sums up to a total of 10 USB ports which is maximum on any mITX motherboard on this list. Audio and video output are satisfactory with dual HDMI ports and Realtek ALC1220 7.1 Channel HD audio. For wireless connectivity, there’s an 802.11ac Wifi module and Bluetooth 4.2 support. Overall, the ASRock X370 Gaming-ITX/ac is an expensive mini-ITX motherboard but offers a lot of features that can be compared to ATX boards at the same price. 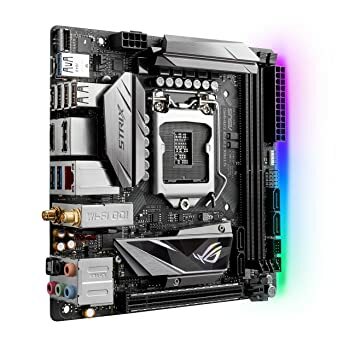 The last one on the AMD mini ITX motherboard section is the Asus ROG Strix B350I. Made with AMD AM4 socket in mind, this mITX motherboard offers a plethora of features justifying the higher price. If you’re at a budget, I would suggest choosing other affordable options I have mentioned earlier. And if not, then let me explain the amazing features of Asus ROG Strix B350I mini ITX motherboard. Being compatible with AM4 socket, you are free to install any Ryzen series CPU or 7th gen A-series/Athlon processor as well. So that’s like packing a whole lot of computing power into a 17x17cm board. You will get one PCIe 3.0 x16 slot in the name of expansion slots for installing a graphics card. There are two DIMM slots with 32GB DDR4 RAM support which can run at a 3600MHz frequency at the maximum. For storage, there are four SATA 6Gb/s ports and single M.2 Socket 3 that lets you avail the benefits of most advanced SSDs. There are a lot of options for connectivity as well including WIFI (802.11 a/b/g/n/ac), Bluetooth 4.2 and Intel Gigabit LAN with ROG GameFirst IV support. Like other Asus mini ITX motherboards, there are six USB ports with four being USB 3.1 and the other two being USB 2.0. With so many powerful components in small space, cooling becoming more important. Asus B350I mini ITX motherboard offers ample cooling options that include 3 fan headers; one each for CPU, chassis and AIO Pump. For audio, it uses M.2 audio combo card and SupremeFX with Sonic Studio III and Sonic Radar III that produce 7.1 channel HD audio output. There are a lot more cool features like the Aura Sync Lighting, LED illuminated audio ports, FanExpert4 with overclocking profile, SafeSlot and VRM module etc. 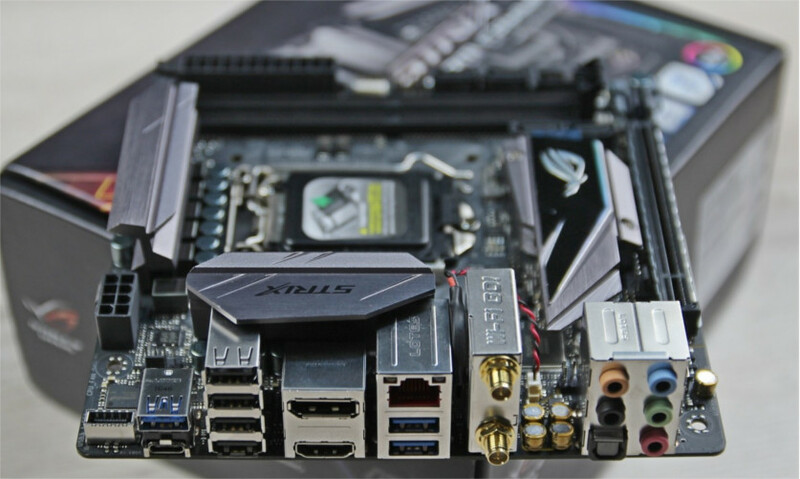 Overall, Asus ROG Strix B350I is an expensive feature-loaded package making it one of the most expensive mini ITX motherboards for AMD processors you can buy in 2019. So, now comes the trickier part – choosing one from the best! Let me clear the clouds for you. See, we all know these motherboards are small and thus there are a few things that you may have to sacrifice in order to achieve the said small form factor. Therefore it becomes important to see what ports and features are there and do they match the requirements you are looking for. I have pointed out some of the most significant things that you must look for before choosing a mini ITX motherboard. Here you go. First and the foremost thing to check out is a PCI Express slot. There should be at least one PCIe x16 slot on your mini ITX motherboard. Why? Because that’s the place where your graphics card go. Without that can simply forget about building an SFF gaming PC. Not many mITX boards offer more than one PCIe x16 slot, if you can afford one, don’t think twice. Only if you are low on budget and won’t be needing a discrete graphics card, then the last option is to go without it. SATA connectors are for storage mainly. My recommendation is to at least have three SATA 6Gb/s ports. One for the main HDD, one for the DVD/Blu Ray Drive and one for an SSD enabling secondary storage. Generally, most mini ITX motherboards do offer three SATA ports, and if there are four, its a plus. Next is an M.2 module if you’re looking forward to installing an M.2 NVMe Solid State Drive. It will allow you to take advantage of ultra-fast memory. This is a crucial call for both HTPC makers or SSF Gaming builders. Reason? Because in both cases, correct display ports are going to allow you to have HD graphics both for video and graphics. Always what type of ports are available on the motherboards. Among the mini ITX boards I have listed, you will find at least one HDMI and a standard Display Port. Make sure you use a compatible display to ensure great integrated graphics performance. The HDMI becomes more important for those who regularly hook up their build to a TV (like a home theater PC or for Gaming). It allows you to connect to most modern TV screens available in the market. Among other things falls the USB ports, WIFI AC and LAN module. With the demand for more and more faster read-write speed over USB, most devices are switching to USB 3.0 or even USB 3.1. So, always ensure there is a couple of USB 3.1 ports. But that does not make USB 2.0 needless. The older USB ports are useful for adding other peripheral devices that do not require read/write operations. A high-speed WIFI AC and LAN module will definitely help in streaming 4K videos and playing multiplayer online games. Here is a bonus video that covers all important things to keep mind as you buy an mITX motherboard. So that’s all in this mini ITX motherboard roundup. There were a lot more options that could be included but as Glinkster strives to recommend you what’s practically best, we already eliminated the necessary ones. I strongly believe your search for the best mini ITX motherboard must have ended and you have now found the right choice for yourself. Before wrapping it up, here is the Glinkster’s final verdict on the tested mini ITX motherboards in this post. 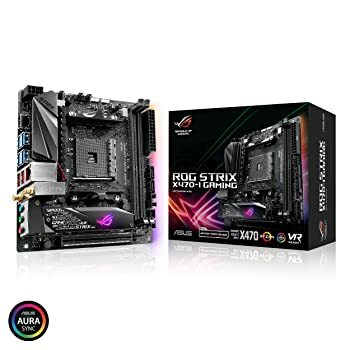 For gamers who want to go with Intel-based processors, Asus Strix ROG 270I is the best high-end mini ITX motherboard while for those building a budget SSF build, ASRock Z370 is the best budget mini ITX motherboard. 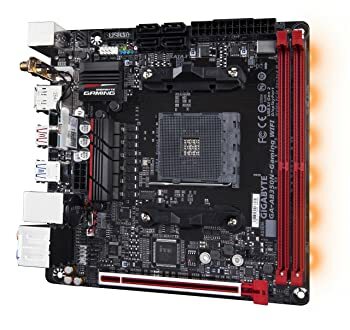 For gamers who look forward to using AMD CPUs, ASRock X370 is the best premium mini ITX motherboard, while for those look for an inexpensive option, Gigabyte AB350N is the best most affordable mini ITX motherboard. So, guys, I believe this post must have helped you. If it did, please share with your gaming friends. Don’t forget to tell me your views about the mini ITX motherboards in the comments. If you have any queries, I will be more than happy to answer, please ask in the comments section below.